Hey, US card collectors. Do you remember when cards were just cards? Through the 1980s? Japanese cards were just cards, too - just have a look at Calbee's offerings through 1990 and beyond. Do you remember in 1989 when holograms started being put in packs? Japan started including holograms too (1989 Calbee, 1991 BBM). Do you remember in 1992 when parallels first seriously hit MLB packs? Japan started including parallels too (1995 BBM). Do you remember in 1993 when the first super-premium sets (Fleer Flair, Topps Finest) were issued in the States? Japan's first mainstream premium set hit shelves in 1995 (1995 BBM Diamond Heroes). Do you remember in the mid-1990s when Upper Deck put the first jersey cards in baseball packs? Japan started issuing relic cards too (1997 BBM Diamond Heroes). Do you remember around 2001 when relic sets (Absolute Memorabilia) changed the focus toward hits? In 2002, BBM dropped Diamond Heroes to introduce Touch the Game, a relic-based super-premium issue. Do you see that many releases in the past few years have been high-cost ultra-premium boxes with few cards (Topps Tribute, Museum Collection)? Japan has that too: Epoch now, and Frontier in the past, and BBM has issued a few high-priced sets as well (2018 BBM Glory, for example). On Demand cards have become relatively common in the US, with Topps' online offerings, especially Topps Now. Well, Epoch has Epoch One. I've ordered a few cards from Epoch One just to forward on to NPB Card Guy, but I do have a card for my collection. And while I believe this card was distributed in a manner different from the usual online ordering system, it does tie in to that set. 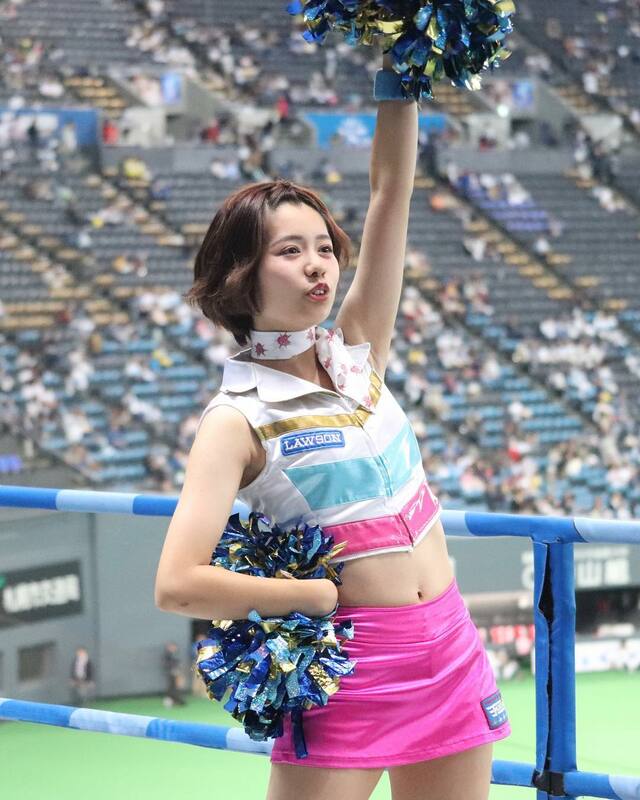 Ami Inamura is perhaps the baseball poster child... or baseball model... or something like that... of the past several years, appearing in JWBL (women's baseball) and NPB (men's baseball) sets several times as she makes appearances at events and throwing out first pitches. Of course, I had to have this card for my collection as well. What's next for MLB? And how long will it take for NPB card manufacturers to copy it? I wish it was a set I could finish this year, but I believe that the 1973 Calbee set will take quite a while to finish with all the SPs toward the end of the set. Calbee's 1973 set really has a classic Kodachrome feel to its photos. I also like how I can see the stadium clearly in two of those cards, quite likely photographed on the same day. Literally. This is the most expensive card in the set, going by price guide values... except for Shigeo Nagashima's iconic card #1. Which I still need. It's a good photo, too, mainly because it's just one studio shot in a set full of in-field images. Uniqueness is key! Last summer, Japan was hot. Records were broken, and records probably melted, too. An old iPod Touch I used as an alarm clock actually broke open from the heat melting the glue holding it all together (the battery didn't explode, and the iPod was powered down and not plugged in at the time). This was inside my apartment, mind you. I was in Sapporo, which is in Japan's northernmost prefecture. It's cooler up there, but that didn't stop things from being quite warm. And as I mentioned a few days ago, a lack of air conditioning in my apartment meant that I was staying up until about 3 AM most nights when it was cool enough to actually go to sleep. That strange sleep schedule and the extreme heat meant I didn't do a lot of what I would have liked to do. I made it to a few touristy places, and I did spend a lot of time walking around the downtown Sapporo area and Nakajima Park. But I didn't take any of my planned day trips or overnight trips, and I didn't get to any baseball games. I caught her name when they did a sort of roll-call/introduction thing after the first dance number. She's cute, of course, but I liked her personality; she was really cheerful (wow, a cheerful cheerleader!) and really seemed to enjoy what she was doing. Other performers often just go through the motions, especially for these smaller performances. So she stood out in the group. A bit of searching later through the Fighter's website, I could properly get her name, and found this official autograph through Yahoo Japan Auctions. And that's the story of how Tomoka's card ended up in my collection. Photo credit to whoever took this photo. I have no idea. Sticking with the Fighters, back in November, the Fighters announced details on building a new ballpark. It will be located in Kitahiroshima, a city on the outskirts of Sapporo, with a retractable roof and big glass wall. The stadium is still about four years away, but if you are interested in seeing a baseball game at Sapporo Dome, I would start figuring that into your plans. Sapporo Dome is an interesting ballpark, though actual baseball there is unimpressive. The real draw to me is being able to go up to the observation deck to see out into Sapporo, or get a unique view of the field below. The stadium does have some unique features which allow it to be converted from baseball (artificial turf) to soccer (natural grass), but the baseball experience wasn't that special from the stadium perspective. I did like the proximity to Sapporo proper; the staidum could be accessed after a short walk from a subway station. I do hope that the new ballpark has a lot of good fan experience areas planned, including restaurants and a museum (Sapporo Dome has a small free exhibit area that includes baseball, soccer, and entertainment artifacts). And I really hope the transportation situation is better; traveling further by train means there should be less walking, and they'll have to take frequency/capacity into consideration as well. Details on the stadium are here including some artist renderings. I work on the road. Last year, I spent at least my weekdays living away from home for the first nine months of the year. And this year is off to a similar start. It has its drawbacks. Posting is tough, since getting cards at local card shops can be quite difficult, and scanning cards becomes a challenge as well. Then there's the whole "Almost everything I own is very far away" problem - I wear the same three dress shirts to work and the same one casual outfit on my days off, and if I forget something, I either have to buy a new one or do without. But traveling means lots of new experiences. Local areas have their own collection of unique sights and experiences, and there are interesting shops to browse through. I love rummaging through second-hand shops. Japan's "recycle shops" can offer up some interesting, cheap souvenirs, like fan jerseys and or baseball knickknacks. Yes, that's a real relic card. For my US readers, relic cards here are much harder to find than in the US. And back in 2004, a card limited to 300 was considered very rare. Engel's last guide to list BBM cards shows this card to be worth $150 (I think... my guide is back at home, and I'm not). Would you pay $150 for a plain white relic? Okay, there's a pinstripe, but still. Did I pay $150? Nope. About 10% of that. I was definitely happy to get a hit I needed at a reasonable price. Yes, most regular relics these days go for about $15-30 here (sometimes as low as $10), but the older ones are tough to find. The card itself is from BBM's 2004 1st Version set. Makoto Imaoka had a generally successful, but uneventful, career. However, for the 2002-2004 seasons, he batted over .300 each year. His 2003 season saw him bat .340, winning the batting title, along with being an All-Star, Best Nine Award, and Gold Glove Award winner that year. His success in 2003 is what earned him a relic card in the 2004 set. Imaoka would end up being a five-time All-Star and three-time Best Nine Award winner, and he also won the RBI title in 2005, all with the Tigers. In 2010 he won a Japan Series with the Marines, though he only played in 26 games that year. Really, after that 2005 season, his career was essentially over. He is currently coaching with the Marines. And, interestingly enough, he was on the 1996 Japan national baseball team that went to the Atlanta Olympic Games, where they won a silver medal. I attended a couple games that year - the bronze medal match between US and Nicaragua, and one other game. I can't check to see which it actually was, but there's a good chance I saw Japan play that year. Anyway, it's a great card with one of many happy memories of my time in Sapporo! In 2018, Nippon Ham brought back their card-plus-meat combination with three products. In addition to Homerun Sausage, they included rare cheesecake flavored cheese pieces, and mini salami pieces. I never found 2017 Homerun Sausage products in stores, though I did get one at the stadium when I got to a game in Sapporo that year. However, I spent my summer in Sapporo last year, and my local supermarket had the sausage and salami products. I didn't see the cheesecake, but I didn't really know to look for it at the time. The card designs are okay on the front, but not enough to get me to chase a set. I like the random product advertisement on the back, though! And as you can see, Nippon Ham actually goes by "Nipponham" when referencing the company. A full set is numbered 1-147, though two cards (#39 and #63) weren't included due to players being traded. It appears that most players have multiple cards. Rare cards titled "We Love Hokkaido" are numbered R01 to R26. Again, card R23 was not issued due to a player being traded. Another rare set, #R27-R44, is called Hokkaido Be Ambitious. I don't know how rare either set is. As a comparison, the 2017 set was #1-146 (two card numbers not issued), We Love Hokkaido #R01-R28, Hokkaido Be Ambitious #R41-R60, with a Legend Series #R29-R40. The 2016 set was also #1-146, with two missing cards, and We Love Hokkaido #R01-R25. Legend Series #R-26 to R-45. Nippon Ham's website states that Home Run Series products were sold in Hokkaido in 2018. So it appears that they are purely a regional issue. Given that the cards only include Fighters players, it makes sense. They also announced 2018 cards were sold starting on March 20th. So any 2019 set will probably be released around Opening Day. Furthermore, the FAQ page states that Homerun Series products could be found at the Kamagaya Stadium shop near Tokyo. Randomly inserted along with cards were points or prize cards. Above is a point card. With a "Hit" prize card, the winner received large-size "bromide" cards. With a "Home Run" prize card, the winner received a framed collection of seven cards. I'm always happy to come across oddball issues! While last year wasn't the best in terms of posting, I met a majority of my goals. With so much accomplished last year, 2019 will prove to be quite difficult. Or, perhaps things will go my way and everything will get done. We'll see, right? That is a total of 15 sets. If I get ten of those, I'll be really happy. Actually, while I'm writing this, 2004 Topps Traded should be on the way, so nine more to go! 2. Have 80 or fewer sets left to complete. In 2018, I knocked about 20 other sets off my want list. Can I get another 20? My new goal is to have only 80 sets that need finishing. I can count 15 sets that have three or fewer cards left to completion. But are those cards easy and reasonably priced to obtain? We'll see. 3. Complete my Pokemon card collection. I only need 12 cards. Let's get this finished! 4. Complete the mini frankenset. I don't know exactly how many minis I have in the set, but I'd like to finish it off. I might be about halfway done, and since I want #1-350, that means I need somewhere around 200 minis. What's really going to make this difficult is that I want to get those minis here in Japan. I could go on SportLots or COMC and grab random minis to just knock everything off the list, but I don't want to do that. Luckily, I recently came across a card shop that has a good number of MLB cards, and prices are decent. Where will that get me? 5. Get team cards for Japan Series and World Series teams. I'm still missing dozens of cards that really should be off my list already. 6. Re-check players with "no" cards to see if that's changed. Several older players have no cards, or at least very few cards. I'm hoping some have found their way onto cardboard in the past couple of years. 7. Get one Nolan Ryan card. I need his 1968 and 1970 Topps cards. If I get just one this year, I'll be happy. If I get both, I'll be ecstatic. 8. Get an Ichiro or Masahiro Tanaka autograph. I need both of them. 9. Add 3 MLB figures to my player collections. I need 12. 10. Get my Japan set want list down to 100 sets. It's around 125 now. I never really cleaned up the list last year, so there are some things that I can just get rid of. And there are plenty of sets that are near completion. 11. Add at least 3 Calbee or BBM sets to my collection. This shouldn't be too hard. Finishing the 2004 Calbee set would be great, and I've also gotten started on 2003 and 2009. Organize my Japanese single card collections. Organize my Japanese player collections by year. Order MiLB cards needed for Japanese MLBer and Player Collections. Order non-sport cards needed to finish off sets. Reformat my Japan Type Collection spreadsheets. Update/print labels for the Japan Type Collection, and apply labels to cards. 13. Organize my complete set lists. They're a mess, mainly because perennial full sets like Allen & Ginter and Gypsy Queen are mixed in with one-off insert sets, Diamond Kings, and other set collections. 14. Create some custom cards. I've played around with and actually designed a couple sets, but never printed any. They focus on filling gaps in my collection where cards just don't exist. I'd like to make actual, tangible cardboard cards. Fourteen goals this year. I've never had a perfect year, but will things change this time? Only.. um.. time.. will tell. I'm several weeks late, but let's look at my 2018 goals again, and how well I did, shall we? This is a good way to get back into the posting habit. First, what tasks were completed, or nearly completed? 1. Complete a to-do list. The housekeeping tasks were easy to do early in the year, but I missed the purchasing tasks. Those two orders weren't made because... reasons. It wasn't because of a lack of funds, but a plain lack of effort. They'll carry over to this year. What goals did I not meet? Organize Japanese single cards. Not being home meant that I never really had time for this. Maybe this year? Update Japan Type Collection. I managed to verify my list's accuracy, though there are some known issues. I've reformatted one of the three spreadsheets (the biggest one), and almost all of the cards are sleeved. But I wasn't able to print labels and thus put them on the cards. Get World Series and Japan Series team cards. I found a couple, but need dozens more. Start a Jersey History collection for NPB. I have essentially abandoned this goal, at least for now. I may come back to it someday. Do a bunch of posting. I kept up with new 2018 sets for quite a while, but of course, once I stopped posting, I ended up falling way behind... five months behind now. I didn't do any Calbee Through The Years posts, didn't post about card shops in Japan, and never posted the card index I had been working on. I keep pushing these goals back. When will they finally get met? WIth a whopping 18 goals in 2018, I did pretty good, meeting 13, or nearly 75%! Here we go again! Story time! I haven't posted since mid-August, so what's up? Well, I was working in Sapporo last summer. Getting cards to post about is always tough when I'm working away from home, which I did for most of 2018 and am now doing in 2019. I actually do have some scans to post about but it never happened. Three weeks after my last post, a big typhoon (Jebi) ripped through Sapporo and Hokkaido. It was the most intense typhoon in Japan in 25 years, and broke several wind records in the Kansai (Osaka) area. Even in Sapporo, it was more than strong enough to rip signs off of buildings and uproot trees all over the city. Several large, mature trees in the park across the street from my apartment were uprooted. And then, one day later, the Hokkaido Earthern Iburi earthquake struck just after 3:00 AM. The first earthquake in Hokkaido to reach the maximum level of 7 on the Shindo scale (6.6 Moment magnitude, IX on the Mercalli scale), and only the sixth since the scale was developed in 1949, it triggered landslides and other damage that killed 41 people - 36 in Atsuma, where the epicenter was located. I woke up when the earthquake hit. I had just started to doze off, actually - thanks to the heat (and no A/C in my apartment), I was going to bed really late and waking up later than usual, after the temperature dropped to something comfortable enough to sleep. I've been through enough earthquakes to know it was pretty big, so I jumped up into the doorway to protect myself. After the shaking stopped, the power went out. I checked my phone a couple times for information, but other than the strength, there was nothing yet. The next morning, my power (and water) was still out, and would remain out for two more days. Thankfully, that was the only real, serious problem for me - I could get water if needed from the tap across the street. But the earthquake also seriously disrupted the food supply, and even three or four weeks later, when I returned to Tokyo, Sapporo's supermarkets had yet to fully recover. I really didn't have much to do with cards during that time - finishing up at a school already takes up a lot of time, and there was plenty of personal things going on to distract me from my blog. My dad and his side of the family are baseball fans, which is a great thing! And he and I spent a day driving down the San Francisco peninsula visiting card shops and getting to know each other a bit more. Unfortunately, I got a bad cold, so I was miserable some of the time, but without getting too much into things (this post is long enough already) it was a great trip both personally and in terms of collecting! My Christmas trip continued back in Georgia, my first time going back there since 2011. All of the cards sent to me through eBay, COMC, Sportlots, JustCommons/CardBarrel, and viewers like you (thanks NPB Card Guy, especially!) were there, and I got a good bit of sorting done. Not enough... definitely not enough. Cards everywhere, for every collection. Some might be extras, some might be in the wrong place. And there are plenty of other cards elsewhere that need to be all sorted together. Yeah, while I worked almost straight for five days on organizing, it's going to take a lot more to get back in full working condition. I brought my scanner to bring images back for posting, but I was so busy sorting and cleaning (and spending time with my mom, of course!) that I didn't scan a single card in the US. Well, with a typhoon, earthquake, living on the road, and meeting my father was more than enough to keep me away from here. And what free time I have had at home has been spent trying to settle myself back in, so that brings us to today.